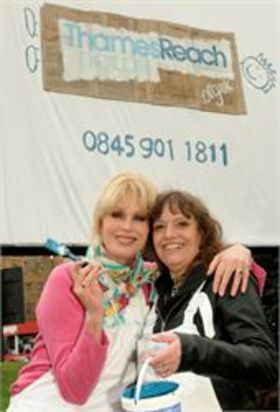 The Absolutely Fabulous Joanna Lumley has set about helping London’s homeless by picking herself up off the street. 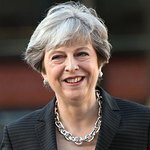 Last week saw her clad in workman’s overalls and aloft in a cherry picker crane in central London, hand-painting a billboard to raise awareness for the Thames Reach charity, which pledges to spend every single penny donated by the public on helping homeless people in London, rather than paying for glossy ads. The campaign is the brainchild of Mark and Lewis, two of London’s foremost creatives from the world of advertising, who gave up their time and expertise for free after seeing people sleeping rough on the capital’s streets whilst they were out training for a marathon. This inspired them to seek out a charity known for providing effective services directly to the homeless rather than spending large sums of money on marketing. Mark and Lewis’s idea was for a celebrity and a homeless volunteer to produce a hand-painted design for the campaign instead of trying to emulate the glossy ads favoured by charities with large advertising budgets. Backing for the campaign came from Clear Channel Outdoor, who donated advertising space on 1,000 bus shelter advertising sites across London along with a large Clear Channel Golden Square billboard in Vauxhall. Lumley says, "This campaign to support Thames Reach and services for London’s homeless is one that I hope gets the backing of the British public. Thames Reach is at the forefront of helping some of the most vulnerable people in our society. Joanna is pictured with Marion Albrecht who helped to paint the billboard was homeless for twenty years, spending much of her life sleeping rough on streets and in shop doorways across Britain. She was helped to escape this lifestyle five years ago and now gives up her time to talk at conferences and at schools about the work undertaken by homelessness charity Thames Reach.